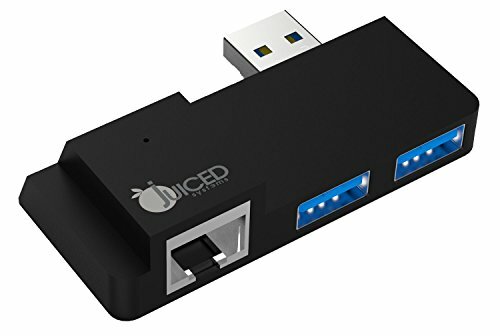 The Juiced Systems Microsoft Surface Pro 4 Gigabit Ethernet Adapter was designed to conform to your Surface Pro 4/ Surface Pro (2018 and newer) perfectly. Expanding your single USB 3.0 port into two USB 3.0 ports and a Gigabit Ethernet (10/100/1000) port. Your Surface's functionality is no longer limited to the single USB 3.0 port. Add an external hard drive, memory card readers, flash drives, mice & keyboard combos, and any other USB peripheral. Change the way you utilize your Surface Pro 4. Direct connect your Surface Pro tablet with a LAN connection featuring fast Gigabit Ethernet speeds (10/100/1000). Gigabit Ethernet Port (10/100/1000) - Connect your new Microsoft Surface Pro with a direct LAN connection to your router. Enjoy lag free seamless internet with a direct connection to you home, work, or hotel network. 2x USB 3.0 ( 5 Gbps ) - Connect multiple peripherals to your Surface Pro tablet. Easily transfer data via thumb drives or external hard drives. Connect a mouse and keyboard to your Surface tablet. Business and travel friendly. Adapter is driver free. Plug N Play ready. Adapter is compatible with the New Surface Pro, Surface Pro 4, Surface Pro 3. Adapter conforms to the Surface tablet perfectly, and will not block the Microsoft Stock Charging cable. *Note* Microsoft Surface Docking station is NOT a stock charging adapter.